At last I can tell you all about the elusive Project 51!! I’m in a group of 12 ladies called the Brit Bee. We were born out of the flickr group Brit Quilt, and were the first 12 people to sign up in April. Starting out as a group of strangers we have got to know each other well and have lots of giggles and laughs each month as we try to make blocks for each other. Sadly, a few months ago, one of our members experienced a very stressful time in her life, culminating in a diagnosis which no-one ever wants to hear. Being the scheming, conniving group that we are (!! ), the rest of us decided to make our friend (let’s call her ‘T’) a secret quilt, in some of her favourite colours, to let her know how much we are thinking of her at this time. 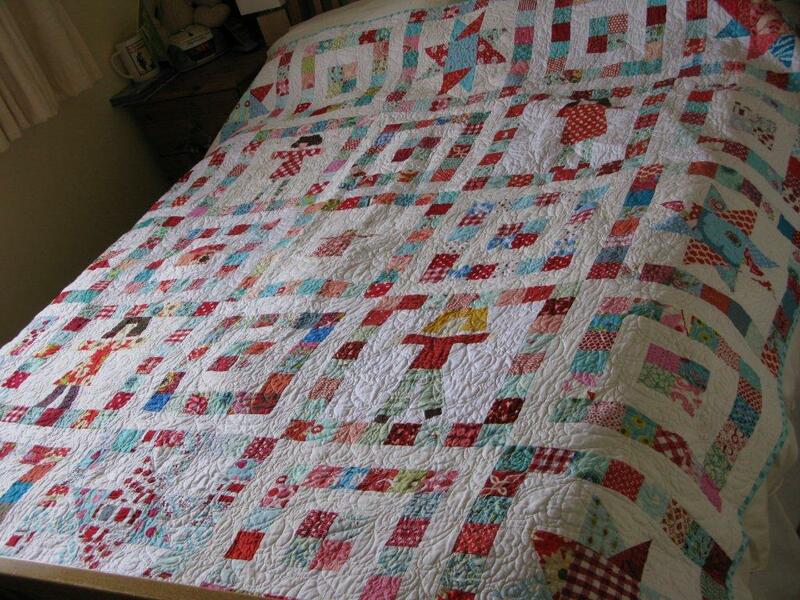 After months of planning, piecing, sniggering and quilting, yesterday T received her quilt! I don’t think there was a dry eye anywhere near where the 12 of us are! That is a king-size bed! 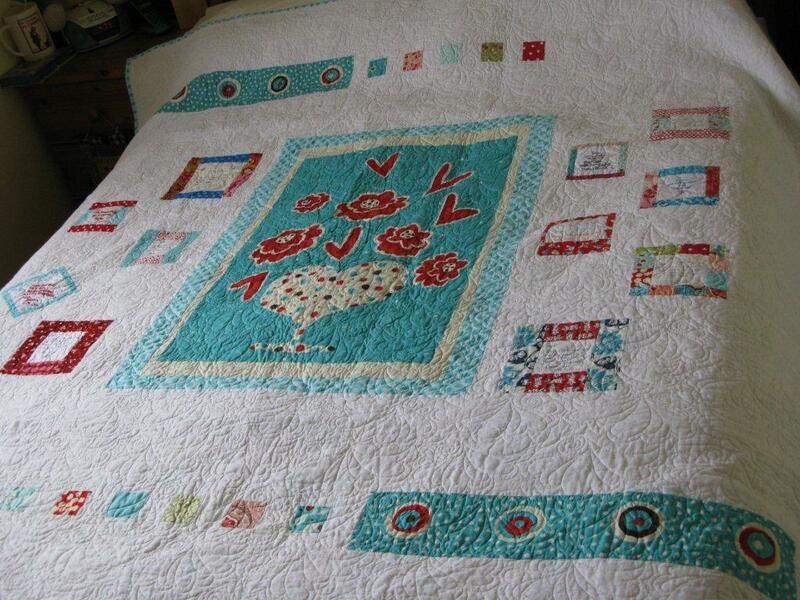 The design is based on Moda’s Starry Eyed Quilt. T has been through the mill. She came home yesterday from a hospital appointment to find our parcel waiting for her to open! Talk about perfect timing! The flickr discussion threads have been full of ‘virtual’ tears, laughter and more than one rude ‘cupcake’ joke! But the most important thing is that T loved her quilt and it brought her a wee bit of comfort and some quilty hugs from far away friends. I am in awe of T’s strength, courage and humour in what has been a hellish few months for her & her family. She has an amazing outlook on life and gutsy determination to take on this illness and fight it. It has been a privilege to be part of this Project and indeed the Brit Bee group – what an amazing group of caring & talented people. A special thank-you goes to Laura-Jane (our Brit Bee mama) for organising us so well, for piecing all our Project 51 blocks together, and to Trudi, for the amazing quilt back she pieced, quilting on her long-arm, and binding and posting this huge quilt off to T. You are 2 in a million!! The back, with all our individual messages & well wishes to T.
Close up of Trudi’s wonderful quilting. 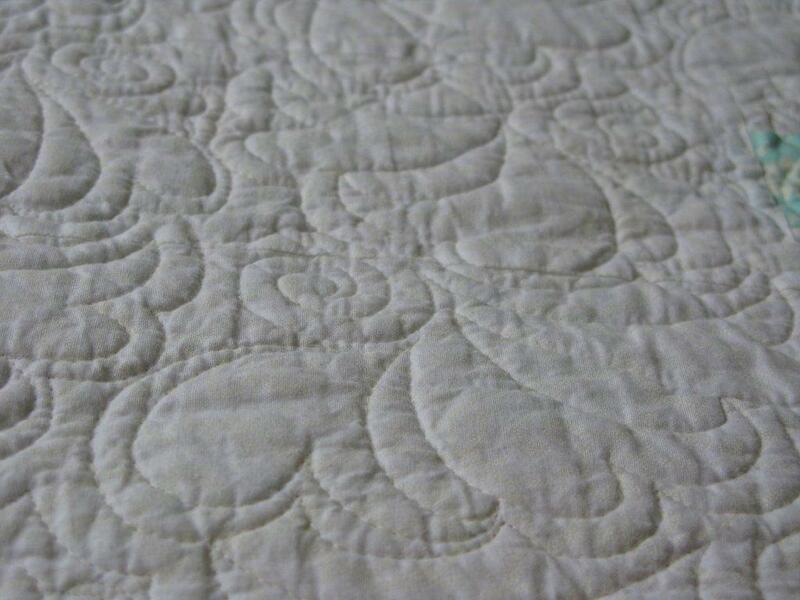 I love being part of this virtual quilting community! Finally, the lovely Laura is hosting a blogiversary giveaway today. 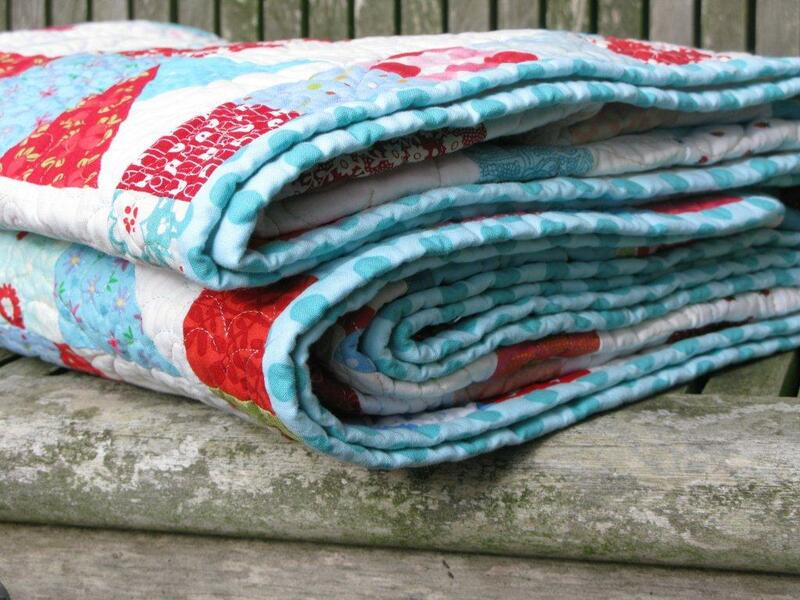 Hop on over for your chance to win some beautiful fabrics. And I’ll have my v.own giveaway here v.soon! Previous Previous post: August Roundup! Next Next post: River Fabrics Giveaway!